The Apple Patch Diet uses a transdermal patch to carry steady levels of an herbal weight loss supplement to the body over three days. That's right, the patch only needs to be changed once every three days, so a box of ten lasts an entire month. 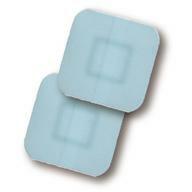 The popular Apple Patch Diet entails sticking a transdermal patch (similar to a nicotine patch) to your skin. The patch's propriety herbal ingredients are said to be designed to help those who wear them to lose weight naturally. The Apple Patch Diet Company claims that their weight loss system is healthy and is not a fad or a crash diet. According to their promotional literature, their patch is different from other diet patches because the latest technology allows them to ensure the highest amounts of the active natural ingredients used to guarantee weight loss success. Weight loss is gradual, and while the patch works to diminish your appetite like a diet pill, it has several advantages over pills. The transdermal patch can be worn on any part of the body, and stays in place while showering, swimming and working out without concern. Its unique adhesive keeps it in place so it can do its job to help keep your appetite controlled. You can forget about it until it is time to replace it. To be most effective, it is recommended that the patch be placed on a different part of the skin every third day. When choosing where to place the patch, avoid hairy areas; no sense inflicting needless pain and irritation when it comes time to remove the patch. Fucus Vesiculosus - Rich in Iodine and an excellent stimulant of the thyroid gland. While the Apple Patch cannot be purchased in stores, it is readily available online. Once you place your order, it should be shipped by USPS Priority Mail and reach you in 3-5 business days in the United States and 5-8 days for international orders. Each box contains 10 patches which is enough for one month. Like any diet, what you do after you've lost your weight with the Apple Patch will be up to you. If you return to the lifestyle and diet that caused you to gain weight in the first place then you will most likely gain your weight back. There is no conclusive scientific data which ties weight loss to the ingredients used in this diet supplement however, the three main ingredients have been scientifically studied and documented and have shown promising results in trials on animals.